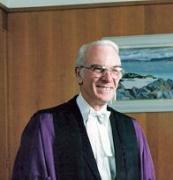 F. E. McWilliam was born in Banbridge, County Down on 30 April 1909, and educated at Campbell College, Belfast. In 1926 he attended the Belfast School of Art and in 1928, Slade School, London, where he won a leaving scholarship which took him to Paris for a year. On his return from Paris, he settled in London, and in 1933 started sculpture. He had a one-man show in a London Gallery, and exhibited with the British Surrealist Group in 1938. During the Second World War, from 1940 to 1945, he served in the Far East as intelligence officer with the RAF. After the war he taught for a short period in Chelsea, and at the Slade School. In 1951 he was invited to Dublin as a guest artist to the Irish Exhibition of Living Art. He was given a number of important commissions, notably the Festival of Britain and Altnagelvin Hospital, Derry. He exhibited in Dublin and Belfast and in 1960 had a one-man show at Queen's University, Belfast. His work became internationally known, and he exhibited in Japan, London and America. In 1966 he was awarded the CBE and in 1971 was the winner of the Oireachtas Gold Medal in Dublin, for sculpture. He was the principal exhibitor at the opening of the Hillsborough Arts Centre, County Down. He died in London on 13 May 1992.